A common and traditional definition of agro processing refers to the subset of manufacturing industry that processes raw materials and intermediate products derived from the agricultural sector. Agro processing industry thus means transforming products originating from agriculture, forestry and fisheries to finished product. 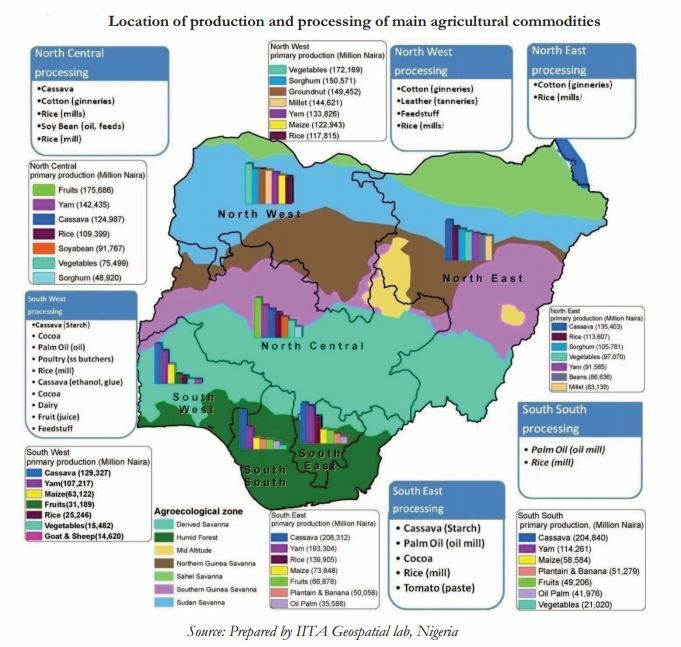 · Aquaculture/Fish Production; .Nigeria alone imports over $900million of fish. Field interviews with Friesland, Chi-Vita, Coca-Cola and Dangote shows that West Africa imports over $2billion and $1billion milk powder and fruit juice concentrate respectively[ii]. However, little attention has been given to the value chains through which agricultural products meet end users within the country and abroad. The magnitude of opportunity losses caused by this neglect becomes obvious if one considers the added value and employment gains that can be generated along agro value chains from commodity to consumption. While developed countries add over US$200 of value by processing one tone of agricultural product, developing countries add less than US$50. Furthermore, while 98% of agricultural production in developed countries undergoes industrial processing, in developing countries barely 30% is processed. Yet agro processing industries in developing countries generate 40% to 60% of manufacturing value added and agro industrial products account for as much as half of their total export. [iii] Examples of some produce that worth a lot more if exported its processed form include Sorghum, Cassava, Rice, and Frozen chicken among others. 1. Employment creation and generation of income- The agro industry has the capacity to absorb a vast amount of manpower in the primary and secondary level of production. Due to the seasonality of agriculture, a production season may experience high and low demand for labour on the farm. Conversely, after harvesting the processing industry can absorb a whole lot of manpower thus creating jobs for the unemployed and generating income for their livelihood. 2. Contribution to a nation’s GDP and manufacturing industry- Most developed countries like Brasil and some Asian countries get huge returns from the export of agricultural products mostly in their processed forms, example is rice. Majority of the inputs in the manufacturing industry are agricultural products. Rubber Latex is used as a raw material in the shoe and tyre industries. 3. Promotes socio-economic development- Strong synergies can exist between agro-industry, agriculture and poverty alleviation. Agro-industry provides capital and services to farmers (e.g. seeds and equipment, training, production and market information), promotes entrepreneurship, raises demand for agricultural products and connects farmers with markets through the handling, processing, marketing and distribution of agricultural products. As a result, productivity and quality of agricultural production, farm returns, and economic stability for rural households, food security and innovation throughout the value chain can be enhanced. 4. Regional stabilization and sustainability- The dense population of the urban areas can be mitigated by adequately developing economic activities in the rural region. Making agriculture lucrative for the rural inhabitants will curb excess migration and foster economic sustainability for the region. 5. Integration into global markets- Most of what we produce are consumed in the country with only a little portion being exported. This is due to the fact that we barely produce enough to meet our local demand which in turn fosters importation of supplementary products. With the current attention the agro industry is receiving, production are geared towards making Nigeria an Agric export country giving us the opportunity to compete in the global market. Agro processing can be classified into three major commodity groups: Crop processing, Livestock processing, and Fish processing. Another latent area is forest wood processing. · Diversify employment opportunities in the rural areas through the establishment of rural-based, small scale agricultural commodity processing industries. The response mechanisms to the notorious inefficiency in public electricity supply include private provisioning, where firms purchase and use their own electricity plants, factor substitution, where firms adjust machinery from electronic to mechanical or manual; output reduction where firms reduce their output and product substitution were firms reduce the range of their products in the market. These responses are costly, as they lead to low capacity utilization, reduced output, and high production costs. These costs are in the final analysis transferred to the final consumer while some firms in the recent past have considered relocating their plants to Ghana and Côte d'Ivoire. 3. Finance-The next major problem in the Nigerian business sector is the high cost of funds arising from the depreciation of the local currency (Naira) against major currencies coupled with high lending rates and extreme difficulties in accessing credit for working capital, especially for small agribusiness ventures. Presently, the lending rate has been allowed to float and in some banks it is as high as 25 percent. This situation however does not favour the development of the industry. 4. Unpredictable Government Actions- There is a high level of uncertainty and lack of confidence in government and its intentions for the business sector especially with the inability to predict government policy. Uncertainty arises basically as a result of the conflicting objectives of government agencies. It is an oversimplification to speak of ''the government'' as there are in Nigeria, a plethora of agencies of government that oversee the workings of the business environment. For instance, while the Federal Ministry of Agriculture and Rural Development has the mandate of supervising farmers, the Federal Ministry of Industries oversees agribusiness firms and large industries, while the Federal Ministry of Environment oversees matters related to industrial waste and effluents. 5. Farm Constraints- At the farm level, there are scattered irregular plots of subsistence smallholder production that characterize the Nigerian agricultural system. Geographically, farmers are dispersed and unorganized so that the cost of bulking and consolidating their produce for commercial supplies is enormous. To circumvent the problem of bulking logistics, it is often advised to put farmers into groups. 6. Market Information Service- Market-oriented production requires the use of a real-time market information service. Daily information on market prices can be found in newspapers for traditional export crops such as cocoa but is completely lacking for other crops of industrial importance such as rice, sorghum, cassava, maize, and horticultural crops. Existing market information services are of no assistance to farmers and agribusiness firms as information is collected monthly by public agencies, basically for research purposes. Hence, both farmers and agribusiness firms are forced to operate in a non-transparent and speculative business environment. However, inspite of the obvious challenges facing the agro processing industry, it is still a very profitable and lucrative venture as it is the only highly viable lee-way for escaping the looming economic issues facing the nation and the world at large. Developed nations have long taken giant steps exploring and benefitting from the opportunities it presents for total economic restoration on a personal, national and international level. [v] Marchet. J. M. Nasir, J, Ramachandran V, Shah M. K., Tyler G., Zhao L 2001. Results of the Nigeria Firm Survey, Regional Program on Enterprise Development, Africa Region, The World Bank, Draft for Review. All data and information provided on this site is for informational purposes only. agriculturenigeria.com makes no representations as to accuracy, completeness, correctness, suitability, or validity of any information on this site and will not be liable for any errors, omissions, or delays in this information or any losses, injuries, or damages arising from its display or use. All information is provided on an as-is basis. processing of different livestock such as poultry, fish into other finished products for the market.